Many physical problems that are usually solved by differential equation techniques can be solved more effectively by integral equation methods. 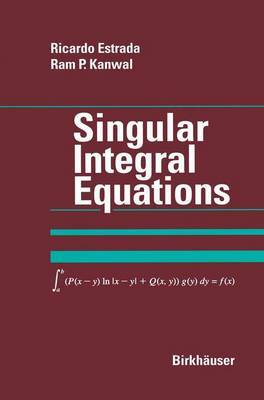 This work focuses exclusively on singular integral equations and on the distributional solutions of these equations. A large number of beautiful mathematical concepts are required to find such solutions, which in tum, can be applied to a wide variety of scientific fields - potential theory, me- chanics, fluid dynamics, scattering of acoustic, electromagnetic and earth- quake waves, statistics, and population dynamics, to cite just several. An integral equation is said to be singular if the kernel is singular within the range of integration, or if one or both limits of integration are infinite. The singular integral equations that we have studied extensively in this book are of the following type. In these equations f (x) is a given function and g(y) is the unknown function. 1. The Abel equation x x) = l g (y) d 0 < a < 1. ( / Ct y, ( ) a X - Y 2. The Cauchy type integral equation b g (y) g(x)=/(x)+).. l--dy, a y-x where).. is a parameter. x Preface 3. The extension b g (y) a (x) g (x) = J (x) +).. l--dy , a y-x of the Cauchy equation. This is called the Carle man equation. "The book represents a well-written and richly illustrated by examples textbook for those who want to be introduced to the topic... The book...might be very useful for advanced engineers and students. Special features, distinguishing the book from others...are simple exposition (minimal number of lengthy proofs), ample examples, and exercises... The authors supply by examples almost all principal sections and demonstrate practical use of the exposed theoretical material. Bibliographical notes and exercises conclude each chapter." "The content and style reflect the fact that the authors address their book to those who are interested in applications, like physicists, theoretically inclined engineers and other scientists working with mathematical tools... The necessary prerequisites are summarized at the beginning in a separate chapter, which makes the material accessible also for graduate students with little background in mathematics... Special features of the book in comparison with most texts on singular integral equations are the distributional framework and the inclusion of Hadamard finite part integrals... The authors give explicit solutions and formulas...making the book a good reference for those who need to solve concrete problems. Many worked-out examples and exercises...help the ambitious reader to get some practice and may serve as a valuable source of problems for students and lecturers."